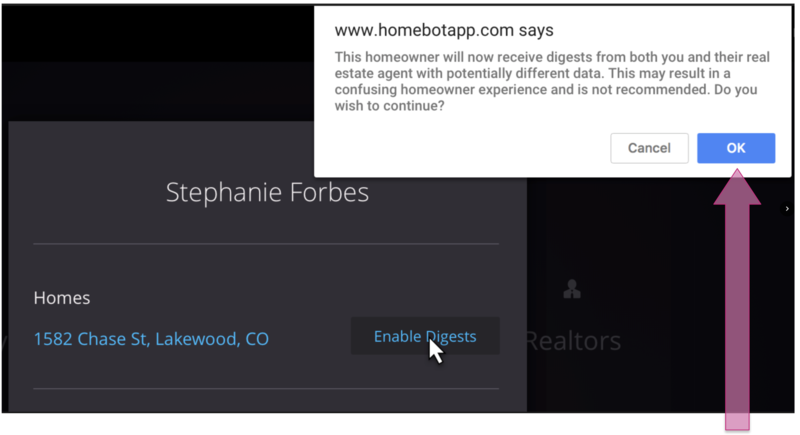 If you have shared, mutual clients with your realtor or lender partner, Homebot has the ability to "pause" digest sending from one or the other (we recommend pausing them from the Loan Officer since the Loan Officer's branding appears on the Agents' Digests). Note: if you are not currently in a co-sponsored relationship, this does not affect you. This has been an overwhelmingly popular request from you, our valued customers. For Real Estate Agents and Loan Officers in a co-sponsored relationship, their shared clients may have been receiving duplicate Digests for the same property (i.e. one Digest from each of you). However, we know every homeowner relationship is different so we wanted to respect your judgement by empowering you to make Digest delivery decisions on a case-by-case basis. 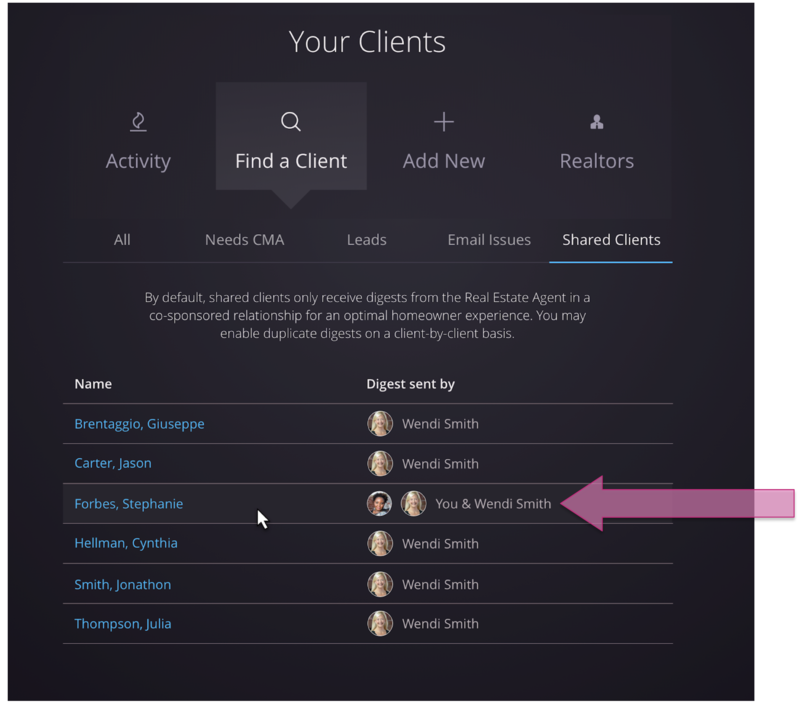 By default, all Shared Clients will automatically only receive their Digests from the co-sponsored Real Estate Agent's account. Again, This will automatically occur by default. However, you can override this automatic behavior on a case-by-case basis. 1. Login to your Homebot account and click on the "Find a Client"tab. Then, you can easily access the new "Shared Clients" sub-tab. 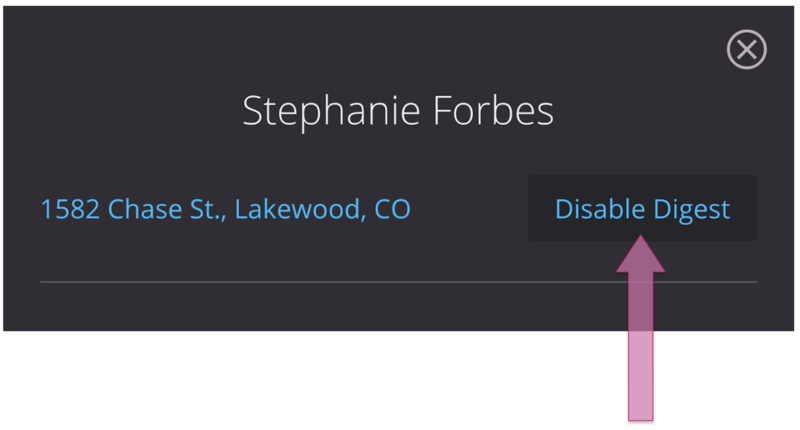 See below the pink arrow pointing to their shared client, "Stephanie Forbes." 2. For Loan Officers, you can allow duplicate digests on a case-by-case basis. 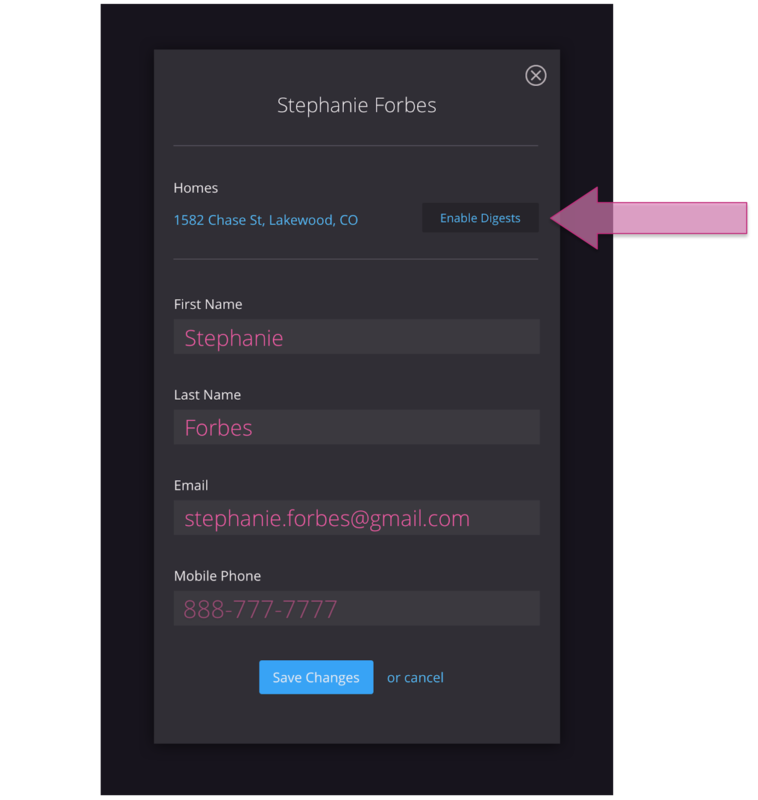 Simply click on the client's name (ex: Stephanie Forbes) to view their contact settings. Then, click the "Enable Digests" button. 3. You will be asked to confirm this decision. Continue by clicking "Ok" or "Cancel". 4. If you change your mind later, you can just as easily disable duplicate Digests at any time. You can access the "Disable Digest" button under the client's name, next to their address. Note: In more complex cases where multiple properties under a Loan Officer share a single email address, they will not be paused automatically. Loan Officers can still individually disable those digests case-by-case on the client contact settings page shown above. If you have any questions at all, please don't hesitate to contact our Customer Support Team!